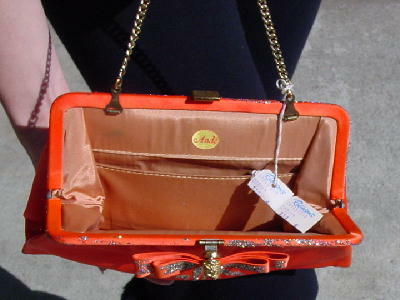 This vintage bright orange purse has a peachy-bone fabric interior with one open roomy pocket. It has a 12" gold-tone link chain and decorative gold-tone clasp with 2 faux ruby stones and a flat double ribbon bow through the center. The Robinson's paper tag is still attached. There are a few dark age spots on the lining. 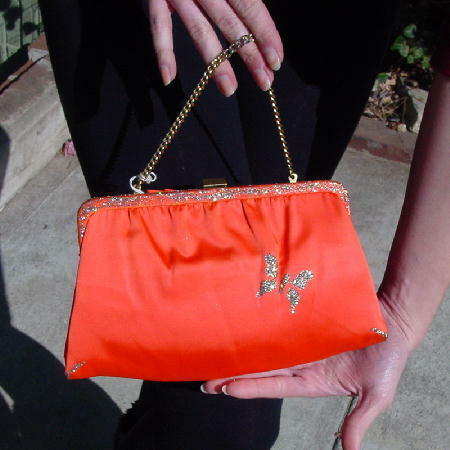 Eden added a multicolored gold-based glitter in the shape of a dragonfly 2 3/4" wide by 2" tall to the front center of the purse. She slash glittered the bottom corners, the entire top trim of the purse, and the bow. On the back side she glittered a butterfly 1 1/2" wide and 1 1/4" tall. This is a wonderful, sassy, special occasion party bag that will be a definite attention-getter.